BO-1A Gold Metallic Cardboard Box Insert 3" x 2 1/4"
BO-1B Silver Metallic Cardboard Box Insert 3" x 2 1/4"
Wedding Cake Box Clear Acetate 2pc. 3" x 2 1/4" x 1 1/2" Quantity 200. Buy three or more of this item and save $ 2.00 on each case. Gold Metallic Cardboard Box Insert 3" x 2 1/4" Fits our BO-1 Box Quantity 200. Buy three or more of this item and save $ 2.50 on each package. 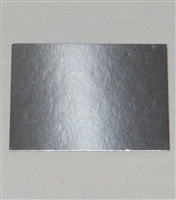 Silver Metallic Cardboard Box Insert 3" x 2 1/4" Fits our BO-1 Box Quantity 200. Buy three or more of this item and save $ 2.50 on each package. BO-2A Gold Metallic Cardboard Box Insert 3 3/4" x 2 1/4"
BO-2B Silver Metallic Cardboard Box Insert 3 3/4" x 2 1/4"
Business Card Box Clear Acetate. 2pc. 3 3/4" x 2 1/4" x 1/2" Quantity 200. Buy three or more of this item and save $ 2.00 on each case. Gold Metallic Cardboard Box Insert 3 3/4" x 2 1/4" Fits our BO-2 Box Quantity 200. Buy three or more of this item and save $ 2.50 on each package. Silver Metallic Cardboard Box Insert 3 3/4" x 2 1/4" Fits our BO-2 Box Quantity 200. Buy three or more of this item and save $ 2.50 on each package. BO-44 Clear Rectangular Acetate Box 2pc. 9" x 2 3/4" x 1 1/2"
BO-52A Gold Metallic Cardboard Box Insert. 4 1/2" x 2 1/4"
Clear Rectangular Acetate Box 2pc. 9" x 2 3/4" x 1 1/2" many uses, Quantity 50. Buy three or more of this item and save $ 1.00 on each case. Clear Rectangular Acetate Box 2pc. 4 1/2" x 2 1/4" x 1"deep. Quantity 100. Buy three or more of this item and save $ 2.00 on each case. Gold Metallic Cardboard Box Insert. 4 1/2" x 2 1/4". Fits our BO-52 Box Quantity 100. Buy three or more of this item and save $ 1.50 on each package. BO-52B Silver Metallic Cardboard Box Insert. 4 1/2" x 2 1/4"
BO-53A Gold Metallic Cardboard Box Insert. 6 1/4" x 3"
BO-53B Silver Metallic Cardboard Box Insert. 6 1/4" x 3". Clear Rectangular Acetate 2pc. Box (Holds 10pcs. )(1/3 lb) 6 1/4" x 3" x 1 1/8". Buy three or more of this item and save $ 1.00 on each case. Gold Metallic Cardboard Box Insert. 6 1/4" x 3". Fits our BO-53 box. Quantity 50. Buy three or more of this item and save $ .75 on each package. Silver Metallic Cardboard Box Insert. 6 1/4" x 3". Fits our BO-53 box. Quantity 50. Buy three or more of this item and save $ .75 on each package.